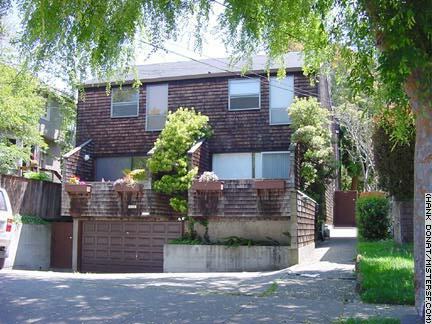 2603 Benvenue Avenue at Parker, Berkeley CA. The astonishing public odyssey of publishing heiress Patty Hearst began two and a half decades ago and continues to the current day. San Franciscans were stunned when the 19 year-old granddaughter of publishing baron William Randolph Hearst was kidnapped from her apartment at 2603 Benvenue Avenue in Berkeley by the leftist Symbionese Liberation Army. Even more unexpected were images of the machine gun-toting child of privilege in surveillance footage as she and her kidnappers robbed the Hibernia Bank at the corner of Noriega and 22nd in San Francisco just two months later on April 15, 1974. In conjunction with robbing the bank (now the Hollywood Video seen here), the SLA released tapes in which Patty denounced her capitalist roots, changed her name to Tania, and announced she had joined the group whose motto was, "Death to the fascist insect that preys upon the life of people." Hearst was used as leverage to extort six million dollars in food for the poor from her wealthy family. The public anxiously followed the story of a political kidnapping by terrorists in America and debated Patty's role in the dramatic events.